A hardware fault has occurred on one of my units and needs replacing with a new one. Is it possible to download the content to replacement unit automatically? Faults with hardware and software often cannot be avoided, equipment can degrade over time and cause downtime in the playback of your content. Once you have identified a fault with an Acquire Player PC, the first thing to do is use Site Manager to Decommission (if possible) using an account with the adequate privileges. 2. 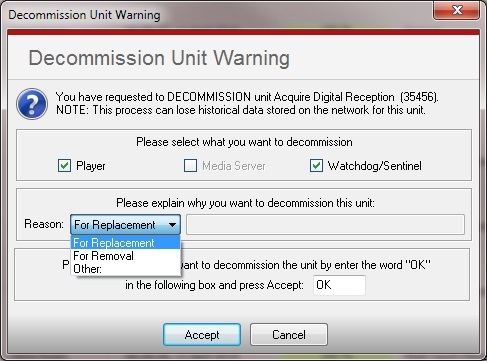 The Decommission Unit Warning window will appear and you will need to choose which parts are to be decommissioned, if the Acquire Player PC is being replaced, select all the items, as shown. You can then enter the reason why it is being decommissioned. If you choose For Replacement, the PLUS! Network Player account is retained, whilst the software licence is made available again. However, the details of which group(s) and site the Player is installed, as well as which content it should have and the logs and reports it has sent are retained. This allows the replacement Player to simply be commissioned and it will be as if the Player was never faulty. The Intelligent technologies within the PLUS! Network will automatically send the content and scripts to the new player with no further interaction required. Please note: to download the content from the Cloud, may take some time and depending on network bandwidth and speed. Therefore it may be useful to leave the Acquire Default Project (go to Acquire Settings) running in the meantime, if you do not have the required Project already installed on the replacement Player or a Manual Deployment of the Project. If you choose For Removal, the PLUS! Network Player account is retained and the licence is made available, but all details about the old player are removed so this PLUS! Player account and licence can be re-used at another location (old logs can still be viewed as part of the reporting service, but the Unit is removed from all groups and settings are cleared). Please note: if you are cancelling your PLUS! Network subscription, this action is required. 4. To confirm, please ensure that you have chosen the correct Player. Type OK in to the box and click Accept. 5. Once the unit has been decommissioned, you simply need to take a replacement PC and commission it as you would normally using the PLUS! 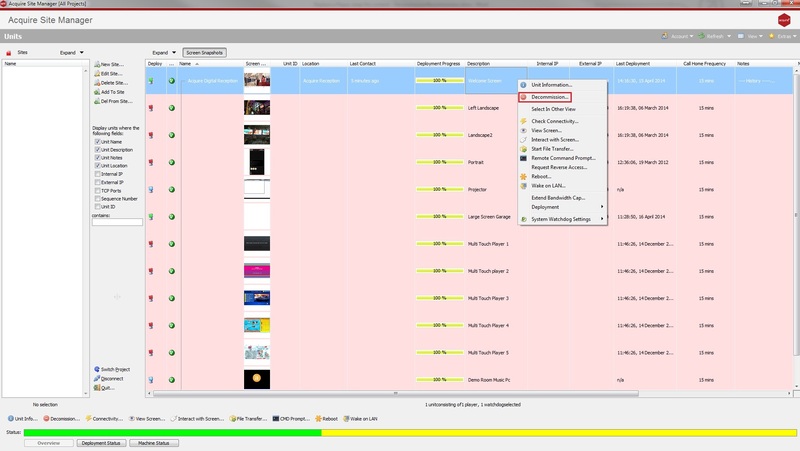 Activ8 software. However, after logging into the network, there is a question basically stating Do you want to commission this as a new player... Or from one which has been decommissioned? To ensure you do not use up all your PLUS! Player licences, and if you are replacing a unit, ensure you choose the latter option. TIP: Although you should be very careful using this decommission feature, if you do make a mistake and accidentally decommission a working player, you can use Site Manager to resurrect the player you mistakenly decommissioned. Simply turn off the option Hide Decommissioned Units and you will see the decommissioned units shown in grey. Choose the one you wish to recover and press Site Information. At the bottom of the Site Information window is an option to Resurrect Unit, choose this and resurrect the options which were live previously. Please note: there is no guarantee that this option will work, particularly if too much time has passed since the unit was decommissioned.